Molly is a normal little girl. Well, a normal little monster girl. It goes without saying that she lives in Monster Land. This is a beautiful, colorful, hilly place made of volcanic rock. Besides Molly there is Edison, a wind-up toy and her best friend, Mama Etna and Papa Popo, Uncle Alfredo and Uncle Santiago, a monster chorus and lots of other nice monsters. Molly is everybody’s dearest and favorite, that is why she never gets into trouble when she does things wrong sometimes. 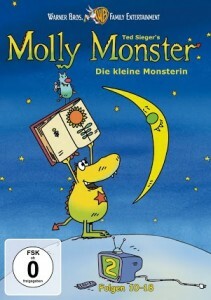 Ted and Andrea Sieger came up with the idea for Molly Monster, and it was directed by Michael Ekblad and Ted Sieger. The 52-episode animated series (2009-2011) is a co-production by Alexandra Schatz Filmproduktion, TrickStudio Lutterbeck GmbH, Little Monster GmbH (Switzerland) and Sluggerfilm AB (Sweden). 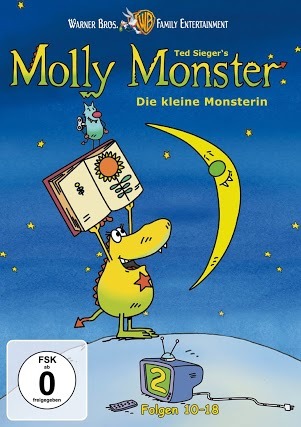 Sophie Rois plays the voice of little Molly Monster and Ilja Richter plays that of her friend Edison. Languages: Swiss German, German, French, Italian, Romansh and 10 more.